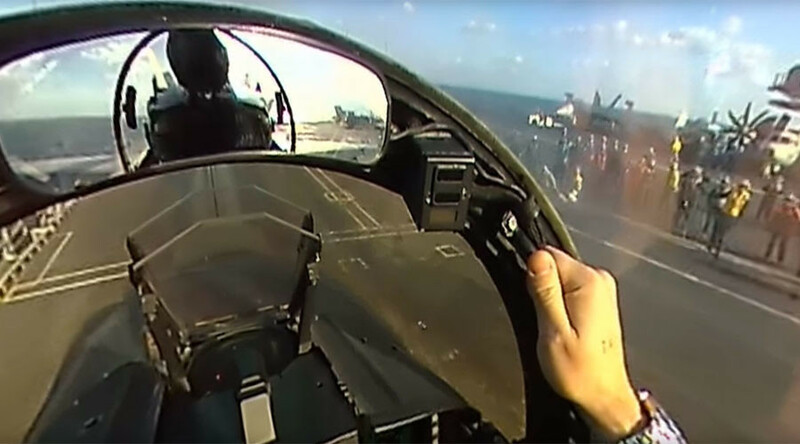 Only a select few will ever experience what it is like to fly a fighter jet off an aircraft carrier. However, a 360-degree video taken on the USS Harry S. Truman has given those who will never have the chance the next best thing. The footage, which can be rotated by dragging your mouse over the screen, shows all the angles from inside the pilot’s cockpit, including his flight plan and watch. The pilot’s name or surname was apparently Christian, according to the name tag on his helmet. He is a member of the Jolly Rogers, or Strike Fighter Squadron 103, which fly the F/A-18 Super Hornet fighter jet. “The F/A-18 Super Hornet is a twin-engine, supersonic, all weather multirole fighter jet that is capable of landing and taking off from an aircraft carrier. Every Super Hornet has been delivered on cost and on schedule,” its makers Boeing said on its website. The USS Harry S. Truman’s flight deck covers around 4.5 acres, and there is plenty of activity with planes getting ready for take-off. If you blink, you could well miss a fighter jet lifting off, as it takes less than five seconds for the Super Hornet to become airborne. The video was filmed on December 12, 2015, during a training mission carried out in the Mediterranean Sea off the coast of Italy. The Hornets are currently involved in a mission in the Middle East, to launch strikes against Islamic State militants in Iraq and Syria.